A couple comments. Thanks for the 2 pages from BB #1. I mentioned to you previously that I have never seen it, and wish they had included it in the Blue Bolt reprint book. I had for the longest time dissagreed with Greg about Champion #8 being solo Simon. One of the reasons being that odd basketweave texturing you highlighted. 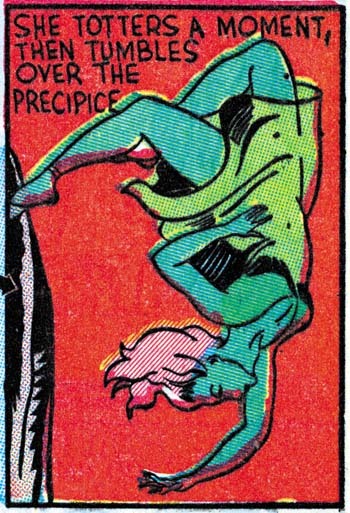 This technique was used by Kirby in “the Diary of Dr. Hayward” plus on some Lincoln Syndicate gag strips. 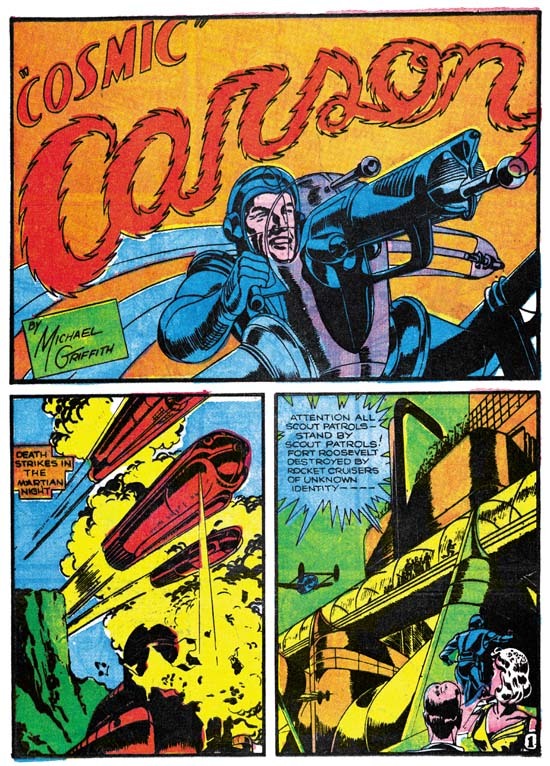 I also believed that the highly detailed work on the ray gun was beyond Simon’s skill level at the time. But over the last year or so, I have reversed my opinion, there are way too many Simon stylistic techniques to be anyone else. It was my finally seeing all the Fox covers at one time that showed me Joe’s progression. One small error, that seems to be a common one. Joe didn’t do Blue Bolt directly for Novelty, his work, and the books were produced through Jacquet’s Funnies Inc. studio. 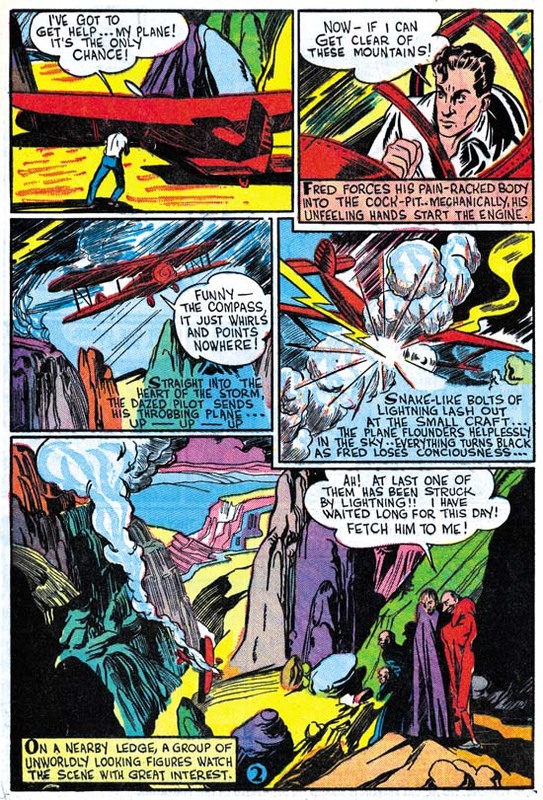 s still a blatant swipe from an Alex Raymond Flash Gordon panel. The helpless girl pose that you have highlighted is probably also from a Raymond panel. I did not misspeak. While preparing this chapter I have looked at the cover for BB #1 and compared it to other Simon work. I do not believe it was done by Joe. Could I be wrong? Sure it wouldn’t be the first time. But that is my position at this time. As for Blue Bolt and Jacquet’s Funnies, I stand corrected. When I wrote the post I had thought that Joe had stopped working for Jacquet when he went to Fox. But when I went back to Joe’s Comic Book Maker he clearly says that he had done the BB #1 work for Jacquet prior to leaving for Fox. 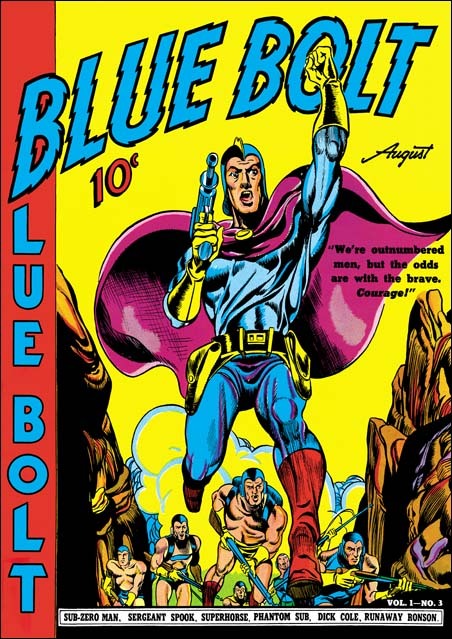 Of course that leaves the rest of Blue Bolt work as uncertain. I think I’ll ask Joe about them next time I see him. As I said in my post, I have no doubts that Joe often swiped. But can you say what exactly what Alex Raymond work it was taken from? Not sure what your not sure about 😉 The hero punching the villain so hard that he goes flying was a Kirby trademark. Others of course did it, but none as well as Jack. 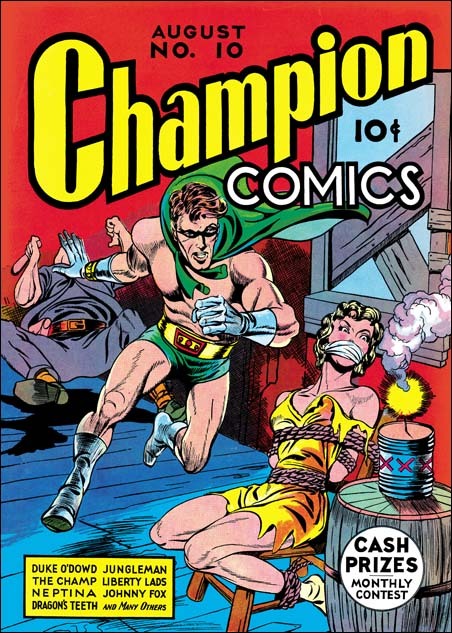 But when I went through work by Kirby done before the Champion #8 cover I could find no examples of it. You would expect a prior Kirby example if Joe did in fact pick up this device from Kirby as I suggested. If the cover to BB#1 isn’t Simon, then someone at Funnies Inc. was doing a hell of a job aping him. 😉 No one did women’s eyes like Simon. I’ll send you the Raymond source. Blue Bolt Magazine was a Funnies account for quite a while. I don’t know if Novelty ever produced their own books. My first post was truncated, I mentioned several panels from Blue Beetle with the villains flying backwards from the good guys’ fist. I’ll send you a few samples. Plus in Socko the Seadog, his punches were as explosive as Popeye’s!! It is hard to compare a cover with interior art. Therefore I compared BB #1 cover with other Simon covers that I feel more certain about. 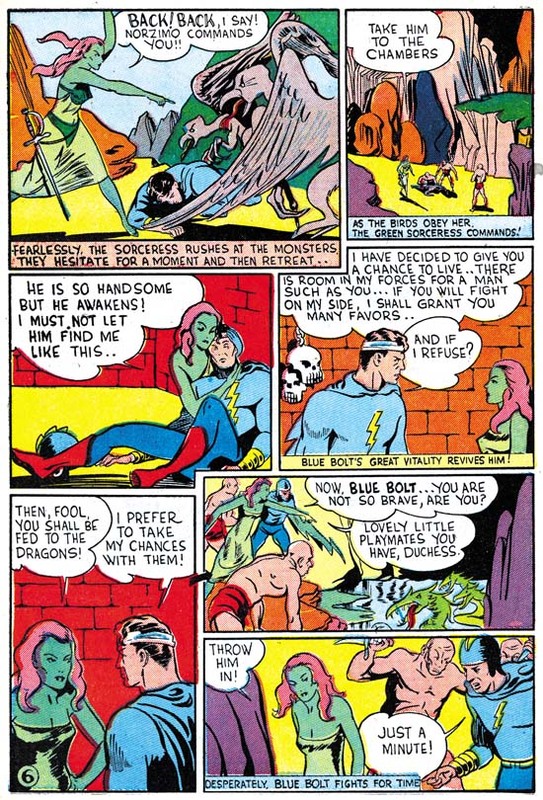 There are a number of penciling traits that are unique to this comic. Also at this period I believe Joe was doing his own inking. Again on BB #1 there are some inking techniques that I have not seen on any other Simon cover. Like I said I could be wrong but I do not feel this was done by Joe. 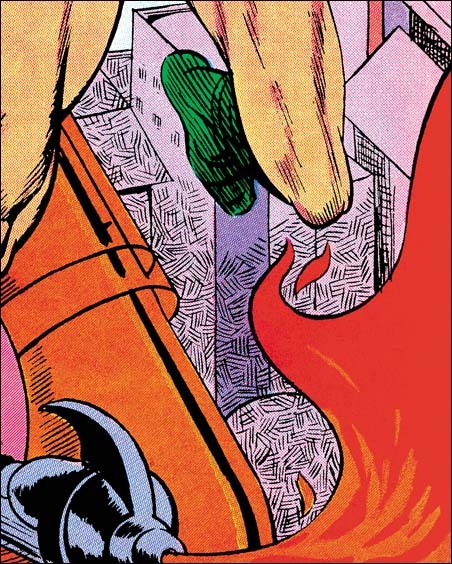 Thanks for your comments about Jack’s punches showing up in Blue Beetle and Socko the Seadog. I can’t say I am surprised. It did seem like Joe was adopting a Kirby device to me even though I had not seen a prior example. I’m finding this all quite educational. 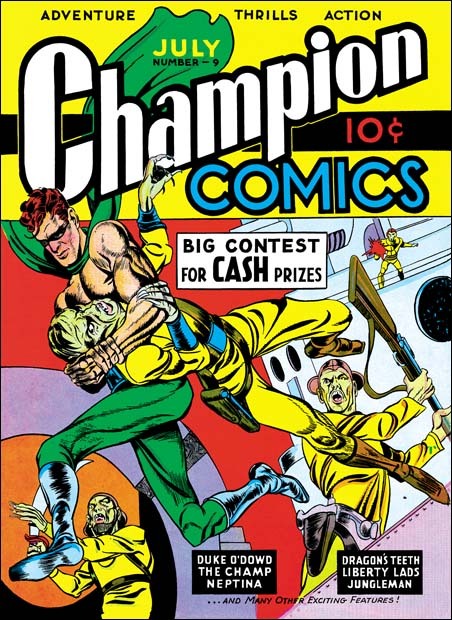 Taking a good long look at the work of Simon in this period side by side with Kirby’s work, I too believe that the Champion 8 cover is by Joe Simon. It’s interesting to see all the examples of Simon’s work and I’m beginning to get a much better feel for both his style and his “fingerprint”, such as the hero overwhelming the cover. 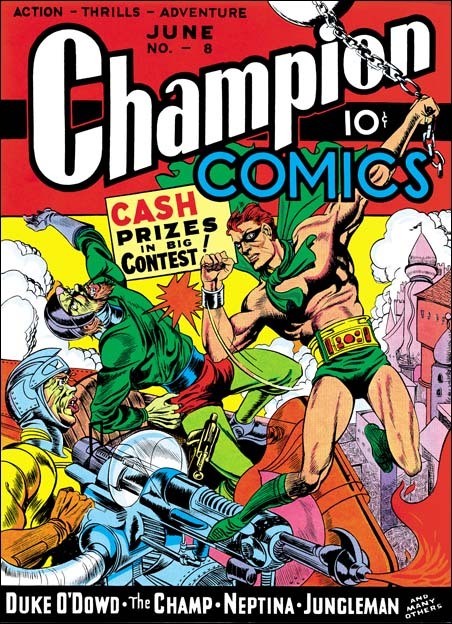 Kirby dynamics come through full force on the Champion 10 cover. He packed a punch from the get-go, didn’t he? Thanks for your kind words. And there is lots more to come with this serial posts. I just wish I could post more often. Unfortunately getting the images to the quality I feel is needed takes more time then I would like. Please bear with me. I hear what you say about Champion #10. Pure Kirby and pure magic.